Boherbue, Co. Cork in sleeps 8 people. Good touring location. Detached modern house for 8. Situated beside a country road, this spacious holiday home boasts two bedrooms with en-suite facilities and has wooden floorboards and two open fires. It is close to the Araglin River, a favourite haunt of anglers, and within a few miles of a number of villages whose pubs offer traditional music of the unique Sliabh Luachra region. You are centrally placed for touring, with Killarney just 20 miles away, and Cork City and Blarney making other possible day trips. 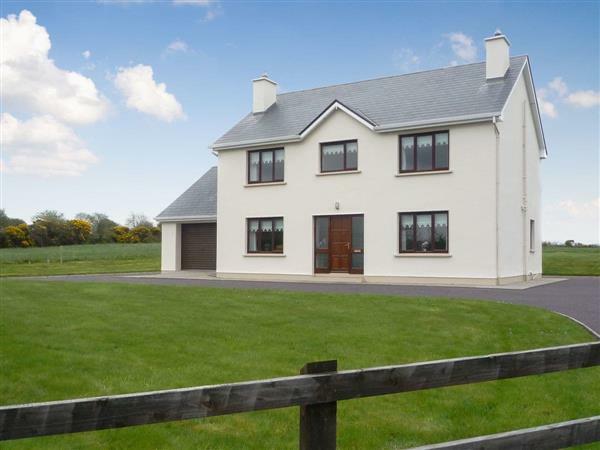 Millstreet, 7 miles, enjoys an international equestrian centre and a Country Park. Shop and restaurant 1.25 miles, pub 1.5 miles. Ground floor: Living room. Dining room. Kitchen. Utility room. Separate toilet. First floor: 4 double bedrooms, 2 with en-suite shower room and toilet. Bathroom with toilet. Open fires in living room and dining room (initial fuel included). Oil central heating, electric, bed linen and towels included. Cot. High-chair. Video/DVD. Microwave. Washing machine. Tumble dryer. Dish washer. Freezer. Lawned garden with furniture. Ample parking. Holidays at Boherbue, Co. Cork run from Saturday to Saturday. For a better idea of where Boherbue, Co. Cork is, you can see Boherbue, Co. Cork on the map below. Do you want to holiday near Boherbue, Co. Cork (W6606), you can see other cottages within 25 miles of Boherbue, Co. Cork; have a look to find your perfect holiday location.